Where do you turn when medication and medical treatments do not relieve persistent, debilitating pain? What can you do when pain interferes with work, family, and social life and you no longer feel like the person you used to be? 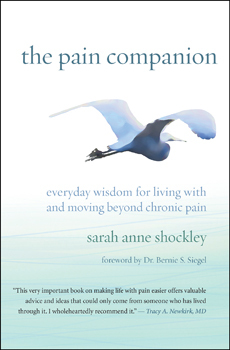 Relying on firsthand experience with severe nerve pain, author Sarah Anne Shockley accompanies you on your journey through pain and offers compassionate, practical advice to ease difficult emotions and address lifestyle challenges. Her approach helps reduce the toll that living in pain takes on relationships, self-image, and well-being while cultivating greater ease and resilience on a daily basis. Dozens of accessible, uplifting practices guide you every step of the way from a life overcome by pain to a life of greater comfort and peace. The Pain Companion also offers profound insights for medical practitioners and invaluable guidance for anyone who loves or cares for others in pain.